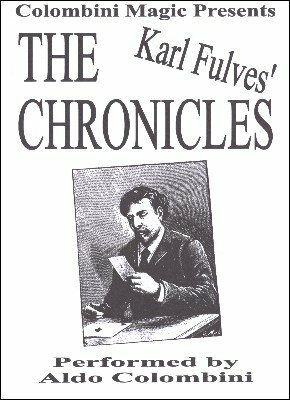 Karl Fulves' legendary magazine The Chronicles was limited to 36 issues, from 1978 to 1988, during those ten years some of the finest close-up magic of the period was explained in its pages. From the magazines, with permission from Karl, Aldo has selected ten routines; just a small portion of that outstanding collection. COIN ENTRAPPED (Mike Skinner): Two coins are on a card box. One is selected by a spectator and penetrates the cellophane. ROYAL BACKS (Jeff Busby): Five cards with backs on both sides change into a Royal Flush in Spades. THE SPECTRUM EFFECT (Fr. Cyprian): You select two cards, the spectator picks two cards and they match yours. They are the only black cards in an all-red packet. COUNT ME IN (Roy Walton): A spectator picks a card (free choice) and, say, it is a Five. The same amount of cards appear between two face-up Jacks. PRELUDE (Allen Lang): A spectator picks the matching card of your prediction and then the four Aces are revealed. ELASTIC ILLUSION (Derek Dingle): A rubber band becomes two, then one and then two again. Everything can be examined. PIN THRU HANK (Richard Durham): A fantastic mini-illusion. A pin is fastened to a handkerchief and a SPECTATOR can release it with no damage to the hank. JUMP SHOT (Karl Fulves & Fr. Cyprian): A rubber band is placed around the deck, then is seen to be around half of the deck and finally around the selected card. OPEN SELECTION (Francis Haxton): A spectator finds his own two selected cards. BLACK OUT (Karl Fulves): One of the best versions of the Oil & Water theme.